The Chase Sapphire Reserve comes with a signup bonus of 100,000 Ultimate Rewards. The best known bonus of the Chase Sapphire Preferred is 50,000 Ultimate Rewards with another 5,000 points if you add an authorized user. Both the Chase Sapphire Reserve and Chase Sapphire Preferred card have the advantage over just having a Chase Freedom card, which only gives a value of 1 cent per point, whether it’s on travel purchases through the Ultimate Rewards mall or just as statement credits. Although the Chase Sapphire Reserve has an advantage over the Chase Sapphire Preferred card when redeeming through the Ultimate Rewards mall, the real value of both cards is their ability to transfer Ultimate Rewards to partners, such as United Airlines, Southwest Airlines, Hyatt Hotels and more. I saved the big one for last, of course. With all those additional benefits, the Chase Sapphire Reserve also comes with a hefty $450 annual fee, and $75 for additional authorized users (who don’t end up with many of the benefits). In contrast, the Chase Sapphire Preferred has a $95 annual fee AND it’s waived the first year. No additional fee for authorized users. Yes, some of the extra fee can be covered by the $300 annual travel credit (above under other benefits), but $300 in travel credits is NOT the same as $300 in cash. 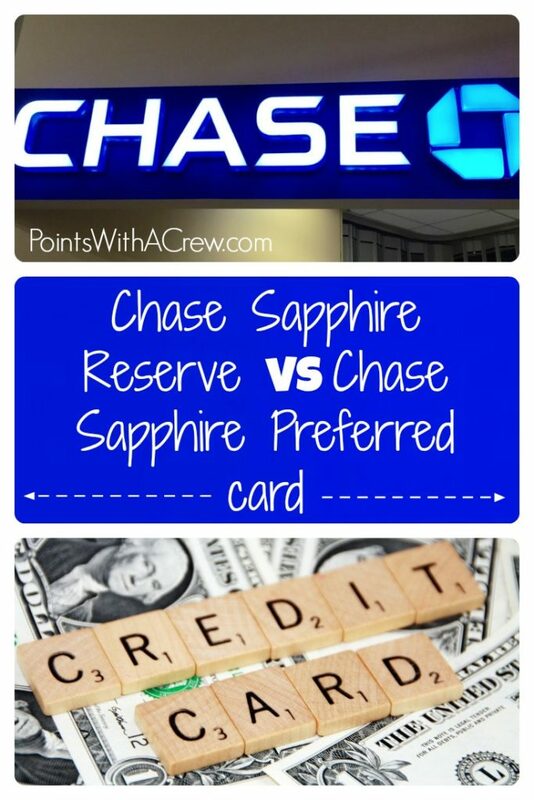 Deciding whether to get the Chase Sapphire Preferred or Chase Sapphire Reserve card comes down to what you’re looking for in a card. I always recommend that you first figure out WHAT TO DO with your miles and points BEFORE applying for a card. If you’re more experienced, and feel confident in the system you have in place that the $450 annual fee will not be wasted, then the Chase Sapphire Reserve card becomes more attractive. Certainly other than the annual fee, there’s no arguing with the benefits of the Chase Sapphire Reserve benefits. So I have the sapphire preferred and have 70k points. If I get the reserve and cancel my regular sapphire…I keep those original 70k pts, correct? If I have a sapphire preferred card, can I upgrade to reserve and get the 100k?
. . . but (if I understand correctly) I open the Reserve card first; hit the spend limit to get the 100,000-point sign up bonus; then — after making sure to transfer the Preferred points into the Reserve account — close the Preferred account, I should keep/maximize everything . . . right? That would be my understanding yes. It’s interesting, but the more I look at this, the less attractive the Chase Sapphire Reserve card is. Not only are most of the benefits already associated with the Chase Sapphire Preferred, but . . .
1) If the Ultimate Rewards points are associated per card, and not per cardholder, it sounds like I would have two small(er) “piles of points” rather than one large one, making it more difficult to use them when a larger number is needed. 3) The biggest downsides are, again for the way I use/travel, seems to be: a) adding authorized users increases the overall annual fee with the CSR, while the $95 fee for the CSP remains $95; b) there is no ongoing $100 travel discount as Chase offers with their other Visa Infinite card, co-branded with Ritz-Carlton; and c) the Priority Pass membership is only for the primary account holder, rather than a Priority Pass Select membership which allows the account holder to bring in guests (a benefit I already receive with the Citi Prestige card). NOTE: according to the Priority Pass website, membership at their “Prestige” level (unlimited member visits, but all guests must pay $27 per visit) costs $399/year if you buy it directly from Priority Pass. This is the level of benefit one gets with the Chase Sapphire Reserve card, and the AMEX Platinum card. Only the Citi Prestige card, as far as I know, offers the “Select” level membership as a benefit where you AND your guest(s) get in free, and is a level you cannot buy from Priority Pass directly. Keeping the CSP and Citi Prestige cards and skipping the Chase Sapphire Reserve card is getting more and more attractive! Up to you of course! A few things though – you can transfer points between cards (And authorized users) for free at any time. I always transfer the points from my and my wife’s Freedom cards to my Ink card. As for the biggest most attractive feature I’d say it’s the 100K UR signup bonus! — and the Priority Pass benefit IS at the SELECT level, same as the Citi Prestige card. There are additional benefits not yet mentioned though hotels . . . it’s looking more attractive again. If you have CSP and decide to get CSR, transferring the points from CSP will make them worth the same 1.5 cents / point. With both signup bonuses, you could get 150,000 points valued at $2250.